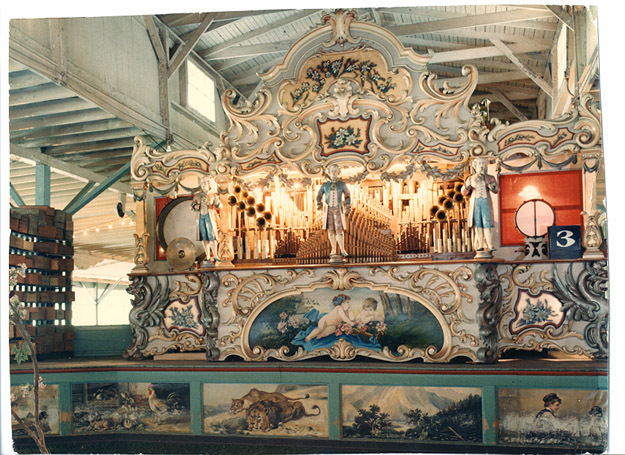 Band Organs, also known as fairground organs and sometimes as carousel organs because of their widespread use on carousels, have been around since the 1700's. They are automatically played, the music being stored on either folding cardboard books or paper rolls having holes punched them to activate the individual notes, sound the percussion, and turn the registers (stops) on and off. Early organs also used a pinned cylinder such as a music box. These were known as barrel organs. Many of the organs also had animated figures such as bandleaders to lead the "orchestra". Band organs manufactured in Europe by companies such as Gavioli (Paris) and Bruder (Germany) were designed to sound like concert orchestras or dance bands. Many dance halls throughout Europe featured these organs rather than a live band. Band organs manufactured in the USA by companies such as Wurlitzer were designed to sound like military marching bands and had a harsher sound than their European cousins. Military band organs used lots of brass pipes such as trumpets to achieve the military sound. The organ shown was manufactured by Gavioli & CIE, probably in the late 1800's as Gavioli closed its doors in the early 1900's. The picture was taken many years ago at Euclid Beach, an amusement park in Cleveland, Ohio.. The Computer Connection: Early data processing systems used punched cards to store data, an idea derived from the storage of music on the cardboard books and paper rolls. The technology evolved and new data storage technologies emerged to include punched paper tape, magnetic cards, magnetic drums with fixed or flying heads, magnetic tape, magnetic disks and disk cartridges, and CD's. As computer (electronic data processing) systems were gradually reduced in size from the huge early systems that were powered by vacuum tubes and transistors (and took tons of air conditioning to cool) to todays PersonalComputers and laptops, people wanted to play music on their new PC's. Many different methods of storing music in files were devised, including a technology known as the Musical Instrument Digital Interface, or MIDI. So we have come full circle - what the band organs gave to the computer industry, the computer industry has given back to the band organs in the form of MIDI players for the organs. The old rolls and books are being converted to MIDI files, and new music is being written for the organs in MIDI format! In 1973, Rich Allen LeVangie was working as a site engineer on a stock market quotation system. Rich always had a love for music having played the Saxophone since his youth, and had a particular love for the band organs having listened to them at the amusement parks in the area. He noticed that most of them were falling into disrepair and decided to do something about it. Doing research (without the help of the internet, of course) he found books about organ building and technology and studied them. He was also referred by a friend to a man in N. Tonnawanda, NY who had what was left of the Wurlitzer Band Organ business. Rich spent some time in N. Tonnawanda to augment his study. He then founded the Bay Ridge Organ Company and obtained contracts with three of the areas amusement parks to restore and maintain their organs. In 1978, Rich left tne NY area to accept a position as a top level computer support engineer for the international division of a major computer vendor, and the organ business was left behind. Today, Rich Allen Data Systems carries on the tradition of Bay Ridge Organ Company, providing Band Organ tuning, repairs and restoration as well as MIDI additions to the organs. There has been a big resurgence of interest in band organs, and we are proud to have played a small part in this resurgence.